If you’re looking for travel information on the Dilli Haat market, this web page is just what you need. Book a trip to New Delhi and enjoy complete information about the Dilli Haat Market and the fantastic deals on nearby hotels, flights, and the best tourist attractions. When traveling to New Delhi in India, do not forget to set aside some time to visit the major attractions of the Dilli Haat Market. Before leaving, take advantage and take a look at a guide book of the Dilli Haat Market or simply this web page that will tell you everything you need to possibly know about it. It contains everything you need to know about making your trip to the Dilli Haat Market truly unforgettable. The word “haat” means an informal weekly market, those that often occur in the rural areas of India. Dilli Haat was founded in the city in 2003 to re-establish the haat experience and provide a place for artisans from across India to sell their products without having to pay high maintenance costs. The result is an art outdoor food market with 200 stalls specializing in arts and crafts of each state of India. Vendors rent space for two-week periods so the variety of products is always changing. Unlike other craft shops and souvenirs in Delhi where you are buying everything from a broker, Dilli Haat lets you buy directly from the artists, many of them from the rural India who come to the city to sell their products. It is one of the best shopping experiences at fair and authentic prices in the city. Do not be surprised if you have to pay a small fee to shop here – this is a great permanent market created in the heart of Delhi. Its products are organized by the region of India from where they came. It is also accessible by wheelchair and has a bathroom! It’s like an outdoor mall … There is also plenty of regional food! It is easily accessible from the INA Bus station and INA metro station. The admission fee is minimal – 60 rupees and inside there is a small souk craft products shop at very attractive prices. You have no pressure to buy anything. The market is outdoors and you can dine at one of the many stalls there on the sides offering food from all parts of India. It is highly recommended to shop here and to end your last day in New Delhi with a visit to the heart of Delhi. Shopping in Dilli Haat is its own adventure. You’ll find the most traditional arts and crafts products from the makers themselves from all over India. It is the most authentic place you can find in India to satisfy your ethnic urges of shopping for traditional products. You’ll find everything here from paintings to local arts and crafts, traditional jewelry, furniture, etc. 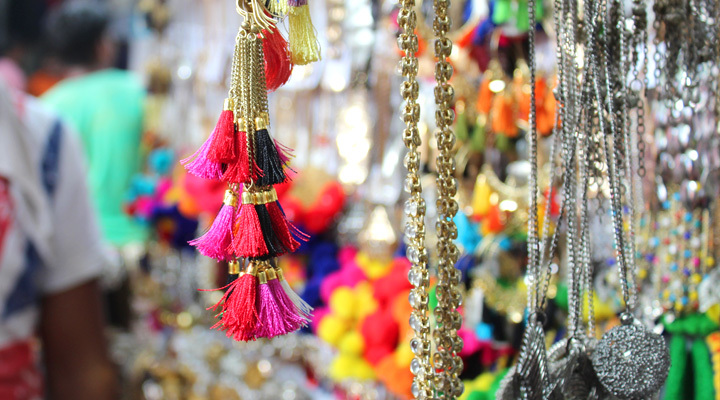 Shopping in Dilli Haat is a shopper’s delight (a shopaholic’s delight). The atmosphere of Dilli Haat is absolutely beautiful. It is a colorful place and the shopkeepers love to haggle so it is highly recommended that you put on your haggle shoes when you leave for this place. It is recommended arriving here around 4 pm, so good 4-5 hours can be spent in shopping and eating. Eating at Dilli Haat is a divine experience. You get to try food from all over India and all the cuisines are 100% authentic and delicious and the best thing of all is, to try and enjoy all the cuisines of India, you don’t have to visit all those different states. All you have to do is visit the Dilli Haat market and you can try several cuisines all at one place! Food bazaar in Delhi Haat is just under a wave, mesmerized! Ethnic cuisine, Maharashtra, Odisha, Bihar, Rajasthan, Punjab, Sikkim, Nagaland, Tamil Nadu make you wonder what to eat and what to leave. Each dish served here is simply yummylicious! Dilli Haat will transport you to the magical world of Indian art and heritage through a fascinating panorama presented through crafts, food, and cultural activities. You can reach the Dilli Haat Market, INA easily through the underground metro station of the Delhi Metro. It was opened not far in time in the year 2010. You can also reach there by car, though traveling by metro is fairly simple and straightforward. All in all, Dilli Haat is a very quaint place with a thousand crafts to buy. If you want to take a souvenir of India, this is the place. The food is awesome but and the beverages are delicious. It is an inspiring place that will enchant you with its vivid colors of Indian culture. Variegated Craftsmen from the different Member States put their touch on positions that had been allocated to them in these colorful outdoor umbrellas. Visiting here will give a traditional feel of Rural Haat or village market but slightly more suited to contemporary needs through their environment. Here is a synthesis of crafts, food, and cultural activity. Entrance fee in Dilli Haat is very symbolic for adults and for children. Originally meant for tourists, Dilli Haat today is equally popular among Delhiites and is usually full of activity. There are some other branches but you must visit the original in INA. In short, it is a bazaar with a focus on the craft shops and restaurants serving cuisine from different parts of India. You can really start to explore India after getting a taste here. They have special months where the shops focus on a particular state or event but any time is enough for the experience!